Out of all the films being shown at the UK Festival of Festival Culture 2014 this was the one I was least looking forward to. A period piece Exit Humanity takes place in the 1870's after the American Civil War. I guessed it would be low budget and seem very false. 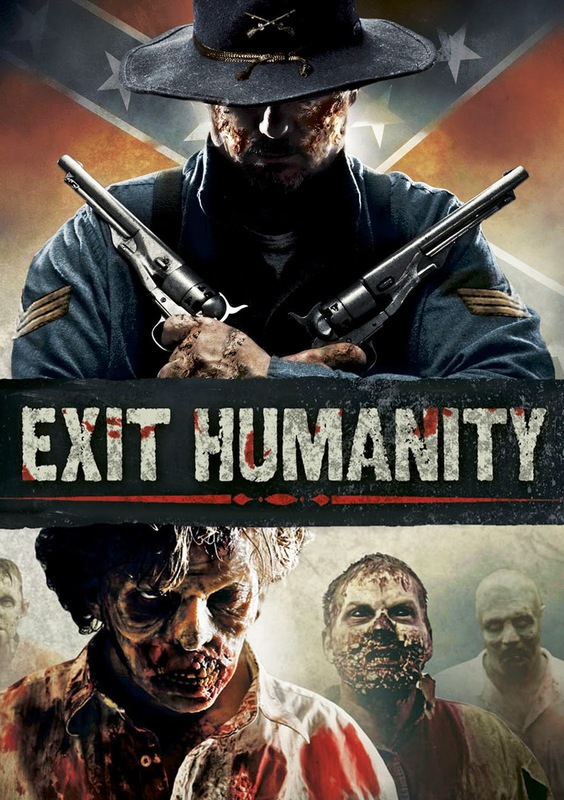 Exit Humanity is an account of a zombie outbreak that takes place in the 19th Century. Mark Gibson stars as Edward Young who arrives home to his family to discover his wife turned, now one of the undead, and his son missing. In panic he sets out to try and find his boy. After lots of misfortune and feeling beyond suicidal Young has just one goal left in his life. On the way to this task he meets a young soldier named Isaac (Adam Seybold) who convinces Young to team up to help rescue his sister who has been captured by General Williams (Bill Moseley) and his men who are trying to find a cure for the zombie plague sweeping the land. This film is simply astounding, it blew me away with just how beautiful it all was. Edward Young is such a tragic character but also a human one. His early tragedies make a real emotional bond to this person, hating zombies with a passion, not caring about his own well being as he has lost everything. There is just no bad acting at all here, there are not many characters but all do fantastic jobs. Special mention must go to Bill Moseley as Williams, I just love it when bad guys get depth to them, here he really thinks what he is doing is the right thing. Straight out of Kill Bill Exit Humanity introduces these bad guys in a fantastic way, each one getting their own title card and description as they pose for photos in black and white. This method really sets them up as something special. The direction and editing is also of such a high standard. Interspersed throughout are animated sequences that fit in perfectly with the time of the film and naturally flow. It is also split up into chapters, each one with it's own title card. Narrated constantly by Brian Cox the story is from the diaries of Young which are discovered in modern day. The diary method works perfectly as it gives the film a solid pacing with the engaging plot paced so well and also provides back story that just would not exist without unnatural long exposition. The zombie make up effects look great and there is plenty of action. It does at times seem like the main characters have infinite bullets for their guns and as usual the real enemies of a zombie apocalypse are humans themselves. It all culminates in an intense sequence that drew heavily from 28 Days Later but a lot of the film is mellow and drawn out to really give a complete look at the characters within. Exit Humanity looks fantastic, has an awesome soundtrack and great acting but what of it's faults? While never destroying the illusion of being the 19th Century it could be said that the sets themselves are quite bare bones. Much of the film takes place outside in woodland and fields but the interior locations are shrouded in darkness or quite small in scope but this didn't take anything away for me. The concept of a diary being found in modern times after a modern day zombie outbreak happening (as told in the introduction) is needless, this works perfectly well on it's own without needing a reason for the diary to be read. My only other petty complaint is that Young roars with anguish so often that it almost becomes a parody of itself, his mournful, anguished roaring even gets incorporated into the plot at one point, it sometimes seems his answer to everything is to look to the heavens and cry out! Those are all such minor complaints though. In terms of horror films I can't think of anything that comes close to this in terms of showing a bygone time. While bleak there is hope saturated throughout and it is very moving with everyone having lost loved ones in a way that gets you in the gut. Essential viewing for any zombie fan is all I can say really, beautiful.